Angela Merkel faces pressure from the right not to bail out Greece, and so she’s been insistent that no direct aide would be forthcoming from Germany. At most, she’s offered “support,” whatever that is.But the politics are different in France. 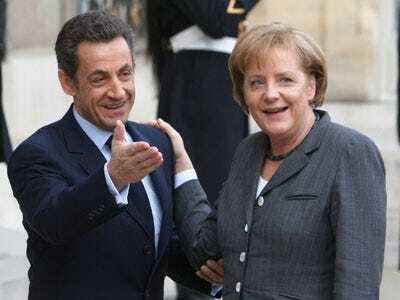 Sarkozy’s party just took a beating from the left in regional elections, and Sarkozy is not keen on letting the IMF bail out one of his fellow EU-members. Dean Popplewell at Oanda notes that the greenback is higher again today, as investors fret about EU stability. See, every one of these rifts helps to highlight the untenability of the EU regime. They shine the light on the contradiction of a shared monetary base with separate political blocs. Until everything’s papered over or resolved, there just isn’t much reason to be excited about the euro.